I have had, on occasions throughout my life, Brushes With Greatness (both real and imagined), or at least acknowledgement, a few times. 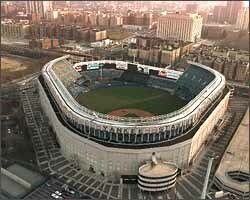 - When I was about eight or ten, I went to Yankee Stadium for the first time with the Lodi Boys&Girls Club. We sat in the bleachers, got sunburn, and watched the Toronto Blue Jays beat my favorite team. When I got back, I told my mom how I had seen Ron Guidry, my favorite pitcher, warming up in the bullpen, how he had acknowledged me and even shook my hand! My mom was so proud! I must now admit, for the first time in public, that this story was a total fabrication. Well, not the part about going to the Stadium, or the Yankees losing to the Blow Jays. But all that stuff about Louisiana Lightning was total bull, made up just for the attention. (Mom, if you're reading, I'm sorry.) Actually, I did that sorta fishing-for-attention thing a lot when I was younger, but it's been a lot better lately. Ever since that pep-talk Marlon Brando gave me, after I provided him with some acting tips during the filming of On the Waterfront, I haven't felt that I had to do that as much. Neat guy, that Marlon. - When I was about 15, I met Lou Piniella in Nordstrom, at the Garden State Plaza. Honest. My mom was even there this time. I got his autograph. Really! - As a senior in high school, I was featured twice in 1993 in articles in the Bergen Record, a paper I delivered for three years as a child, and the paper for whom Bob Klapisch writes, when he's not writing for ESPN. (Alas, Bob and I have never met.) I was Scholar of the Week on 23 February 1993 and I was the most prominently featured of several students in an article on college financial aid (read:smart, poor kids) that appeared on 30 June 1993. - In college, I got a letter to the editor of the Brown & White, Lehigh's student newspaper, published in reposnse to a column written about school prayer. The writer of the column called me about it and we have since become friends. We even played poker at my house last night. Then, a few weeks later, my picture appeared in the Brown & White. Actually, a member of the Harlem Globetrotters dunking a basketball at Stabler Arena appeared, but I was in the audience right behind him, with two friends. - On 11 September 1999, I was featured on ESPN's SportsCenter. OK, not really. But I was in the left field stands at Yankee Stadium, right where Nomaaah's second homer landed, during a BoSawx blowout . The ball ricocheted off my right hand (the one day I forget my glove...), spraining my index finger, and hit some lady five rows back in the neck before some fat guy with no shirt finally came out of the scrum with it. But if you slow the tape of the highlight down, you can just make me out. - In this past year alone, I have received emails from such sages as ESPN's Rob Neyer and The Sporting News' Ken Rosenthal, who was thisclose to publishing one of my questions in his mailbag section in TSN. I think he changed his mind when he realized that my name wasn't really Cleveland Millhous Fitzgerald, the nickname I was using on my Hotmail account for a while. - But now I have really arrived. I received a reply email from Clay Davenport. That's right, the Clay Davenport, of Baseball Prospectus and the Davenport Translations, which do a better job of evaluating players' performances, abilities, and potential than any other I know. Just ask the other nine guys in my Yahoo! Fantasy League, who got their butts kicked over the course of the last year. I thought it was cool when I met a physics prof at Lehigh who had written a textbook, but this is much cooler. I had written to Prospectus to ask about their fielding stats, as these are excellently done and easy to use, if not to understand exactly how they come up with them, but you cannot find players ranked by such information anywhere on their website. You can do player searches, by name, for lots of players, including those who aren't even active, and their fielding stats are available there, but again, no rankings. I didn't really expect a reply at all, much less one from The-Man-His-Self. Clay's (we're on a first-name basis now...) reply said, essentially, that these are coming, but that the guys are all working hard to get next year's Prospectus done ASAP, and so I hafta wait. But it was worth it. Hey, I'd never met a man who had a Translation named after him before.